The Cayuga County Chamber of Commerce’s 109th Annual Dinner is coming up on October 17, and this year’s theme is Spotlight Cayuga. Performing arts are a significant contributing factor to quality of life and the visitor experience in our community, which are both important for an array of reasons. Having a high quality of life helps to keep existing residents here, as well as attract new residents. This in turn strengthens the tax base and expands the workforce, not to mention provides a critical mass to support businesses, entertainment, and activities. A strong visitor experience is important because, let’s be honest, visitors spend money (over $101m in Cayuga County in 2017 to be exact). Tourism is a wealth generating industry as it brings outside dollars into the community, and all that spending generated nearly $13m in local and state taxes to help offset the taxes of local residents and businesses. You can see all of the facts and figures in the Cayuga County Office of Tourism’s Annual Report, found at www.tourcayuga.com/partners/. Given the importance of performing arts in supporting quality of life and tourism, we at the Chamber wanted to spend an evening celebrating this aspect of our community. The Auburn Chamber Orchestra offers a range of opportunities to musicians and music lovers alike. Talented musicians get the opportunity to continue their craft, fans get affordable access to professionally performed symphonic concerts, and some worthy high school seniors are awarded scholarships. “Home of your neighborhood stars”, Auburn Players offers high quality plays and musicals. From Broadway classics to off-Broadway comedies, Auburn Players has something for everyone. The New York Institute of Dance & Education, in partnerships with its affiliate Kaleidoscope Dance Theater, both entertains and teaches. Hosting the successful New York Dance Festival and Harriet Tubman Freedom Music Festival, NYIDE brings world-class dance and music to our backyard and makes the art of dance accessible to all. A staple of downtown Auburn, Auburn Public Theater currently features two stages and a cinema. It provides space for a variety of arts programming, community events, and education, from plays and musicals to standup comedy and open mic nights. With an expansion in the works, APT is growing to offer a full suite of creative spaces. Surrounding APT, downtown Auburn provides various outdoor and public stages, including the gazebo on State Street, the pavilion at Market Street Park, and the stage at Hoopes Park. These venues, among other public spaces, are used for summer concert series and arts events/festivals organized by the City of Auburn and Auburn Downtown BID. Located at the Cayuga Museum, the Carriage House Theater offers a stage and intimate venue for an array of performing arts, and it is home to the Finger Lakes Musical Theater Festival’s “PiTCH” series in the summer. Coming soon: Renovation and restoration of the Auburn Schines Theater is underway! The historic theater will become a multi-purpose performance and event space. It already looks great, but we can’t wait to see the final product! 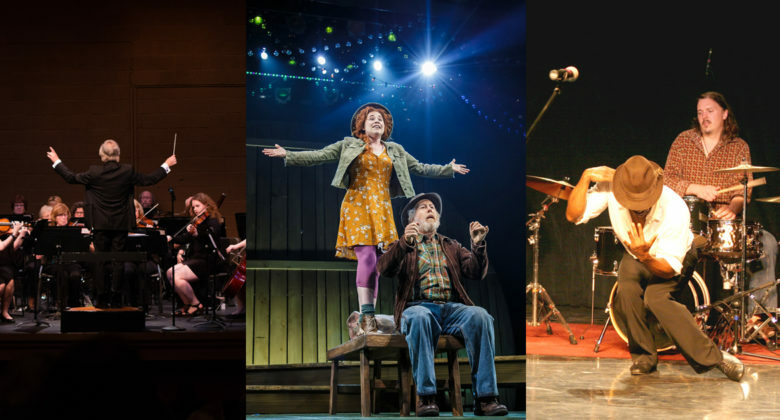 Referred to as “Broadway in the Finger Lakes”, the Finger Lakes Musical Theater Festival brings Broadway-quality theater to Cayuga County. They also own and operate the iconic Merry-Go-Round Theater at Emerson Park and manage the newly renovated West End Theater at West Middle. The West End Theater is available for rent, but is also home base for the Merry-Go-Round Youth Theater. Arc of Seneca Cayuga’s Spotlight Studio offers individuals with intellectual and other developmental disabilities the opportunity to explore and develop creative talents. The facility includes a dance studio and performance studio, among other amenities, and offers public performances each month. Performing arts is an important part of the Cayuga County community. These organizations and venues provide unique and unforgettable experiences for residents and visitors alike. From theater to comedy to local music, we have so much entertainment on offer. So come Spotlight Cayuga with us on October 17th at the Emerson Park Pavilion. Please register by October 10. Registration is available online at cayugacountychamber.com. Tracy Verrier is the Executive Director of the Cayuga Economic Development Agency and Cayuga County Chamber of Commerce. Published in the September 27, 2018, edition of The Citizen.